Filled with new gameplay, storylines, mechanical improvements, and multiplayer, Assassin’s Creed: Brotherhood is far more than an expansion. 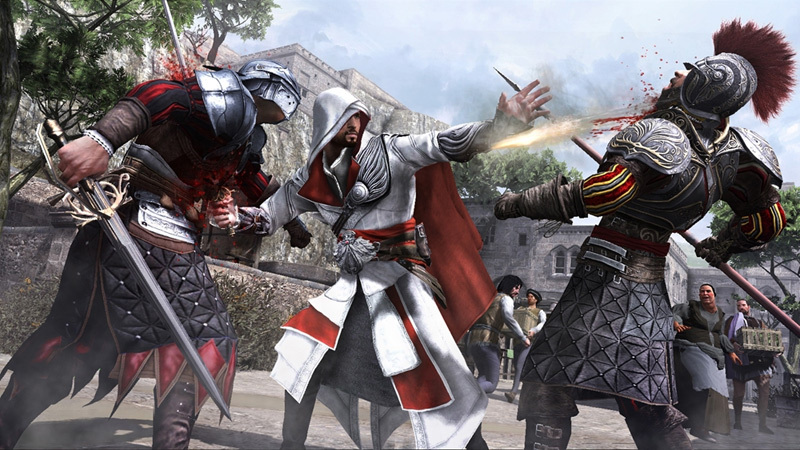 Though Brotherhood lacks some of the sense of discovery and newness that characterized Assassin’s Creed II, if you look past the surface similarities you’ll uncover a host of new thrills. The series remains one of the most exciting properties in video games, and Brotherhood fills an essential step in the plot as the conspiracy-laden story continues. Many of the gameplay issues have gone unchecked once again, but assassin recruitment, development, and implementation is far more addictive than you might think. The multiplayer component definitely has its moments, but serious players will be turned off by how random it can be. 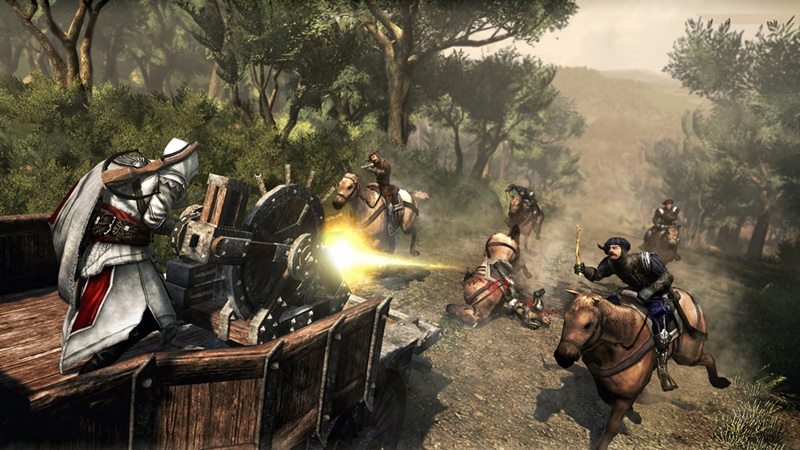 For the series to remain elite it will need to evolve, but for now, its unique premise and core gameplay are more than enough to make this brotherhood one worth joining. 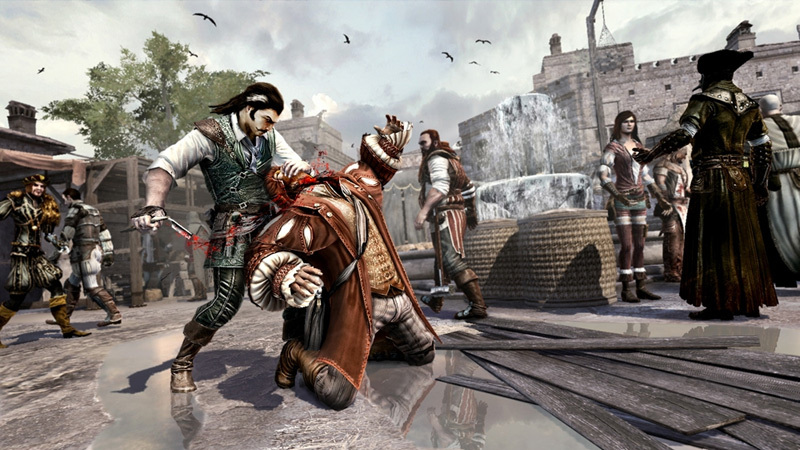 The game isn't about how good you are at fighting -- assassinations are carried out with the press of a single button once you're in range of your target -- or even how good you are at free-running. It's far smarter than that. It's about how good you are at passing (or, hell, even cheating) the Turing test. It's thrilling, it's satisfying, it's occasionally terrifying, and it's a completely unique take on multiplayer. Throw in 50 levels of unlockable characters, perks and items, and ... well, we might just be talking about the next big thing. 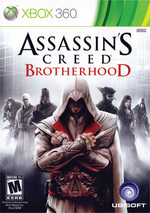 If you were as big a fan of Assassin's Creed 2 as I was, Assassin's Creed Brotherhood is a sure bet. It does all the things the previous game did, and throws in a few surprises as well. It would have been nice if the story had been more welcoming to newcomers, but the ending of the previous game was so up in the air, it's understandable that Brotherhood hits the ground running. Even more surprising than the single-player experience is the addition of a competitive multiplayer game that, through some downright acrobatic contrivances, manages to make the cat-and-mouse core of the single-player work with live opponents. For fans of the series Brotherhood is no optional sidebar; this is as significant an entry as either of its predecessors. 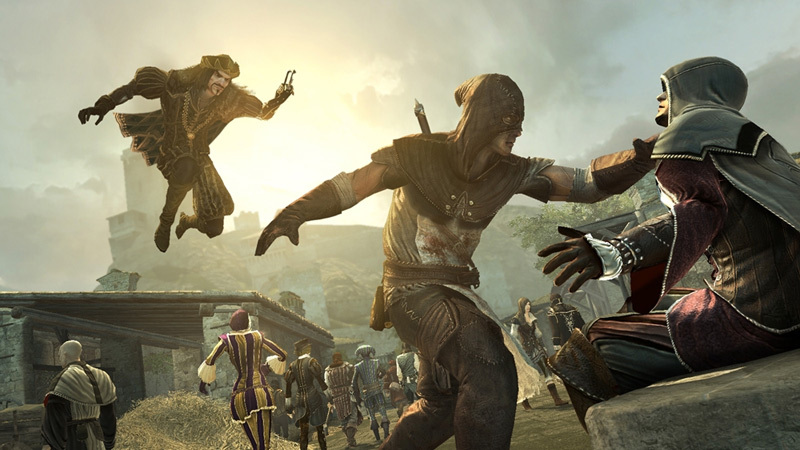 It’s also about as fun as Assassin’s Creed has ever been. It's one of many finishing touches to a game that started life as what sounded suspiciously like a fund-raising stopgap conceived on the back of an overdrawn chequebook and blurted out during a conference call. 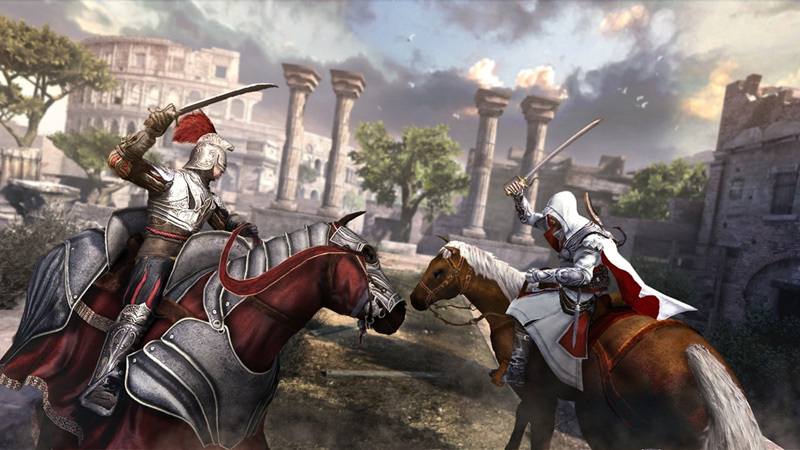 Assassin's Creed: Brotherhood is anything but that, however - it's one of the best games of 2010. Assassin's Creed: La Hermandad es un producto destinado, sobre todo, a los que adoraron la segunda parte de la franquicia. Y no os arrepentiréis si lo compráis: por un lado está la historia, que es totalmente continuista y te dejará saber algo más del Animus, Desmond y las aventuras de Ezio. Por otro tenemos la jugabilidad, que aunque sigue siendo básicamente lo mismo sí que incorpora unas cuantas ideas curiosas. Y, finalmente, el multijugador, que saca petróleo de la fórmula y consigue divertir y ofrecer una experiencia medianamente duradera y atractiva. Voilà qui contre-balance très bien des missions principales efficaces mais qui manquent parfois un brin d'originalité. Les fans ne devraient donc pas bouder ces retrouvailles avec Ezio d'autant que Brotherhood introduit également une nouveauté de taille : un mode multijoueur terriblement bien pensé, accrocheur et passionnant. Si cette suite est moins surprenante et bluffante que ses prédécesseurs en leur temps, elle reste d'une redoutable efficacité, affutée comme la lame secrète de son héros. De multiplayer modi alleen zijn het dan ook al waard om deze game aan te schaffen. Tenminste, als je van Assassin’s Creed II hebt genoten. Brotherhood lijkt namelijk verder in veel opzichten op het vorige deel maar voegt ook het nodige toe. Zo kun je nu je eigen moordgenootschap managen en zelfs als een groep te werk gaan met de computergestuurde personages. De game vervolgt het verhaal van Desmond en Ezio, maar dan met vele toevoegingen. Als je iemand bent die van snelle actie houdt, is dit niet echt een game voor jou, maar alle andere mensen moeten direct naar de winkel sluipen om de game te kopen, want het leven onder de muts van een moordenaar is nog nooit zo heerlijk geweest! Jag älskar inramningen och designen, och den fantastiska akrobatiken. Jag gillar friheten och att det alltid finns något att göra, och där är Brotherhood bättre än någonsin. Samtidigt är det frustrerande att Ubisoft aldrig lägger den där extra tiden på att verkligen polera klart sina spel, och även om Brotherhood är en riktig uppföljare och knappast någon futtig expansion, så tycker jag att det hade mått bra av några månaders finslipning. Animationsbuggar, tveksam artificiell intelligens, kameratrassel och den frustration som dessa kan orsaka när det är som mest intensivt gör att serien aldrig lär kunna aspirera på de där högsta betygen.